Day one hundred forty-eight comes as no surprise to anyone. Rain. Clouds. Overcast skies. That's the phrase our neighbors and the news media use to describe the weather: overcast. One hundred forty-eight days. So what? There were memorable days. Not all have passed unnoticed. Day fourteen, for example, signified two straight weeks of rain. Day thirty-one: a full month. Day fifty-six: eight weeks of rain. One hundred. Closing in on one hundred-eighty. Six solid months. Right now it's coming down in torrents, buckets, it's raining cats and dogs. Has been since Friday night, and now it's…what? Tuesday? Early Wednesday morning? It's not always this bad. Sometimes it's just a mist, a claustrophobic cover woven from a million miniscule drops, impossible to isolate, to separate. The rain grows steadily stronger, it thickens, strengthening each day until it absolutely pours, until the basement floods, filling to the top and seeping into the kitchen. The first time the kitchen flooded we were downstairs, shoveling our possessions into cardboard boxes and running them upstairs. We stacked the boxes wherever we could improvise a vacancy. We left most of the furniture, but grabbed all of the electronics. The first flood only lasted a day and a half before the water receded and our townhouse basically returned to normal. Normal, except for the basement, of course. A sliver of light struggles through the upstairs bathroom window, though this no longer registers as unusual. Not in the least. It's sometime after daybreak, although day hasn't broken through the clouds in one hundred forty-eight straight attempts. It's useless to fight. At this point, we survive. Watching the news today, we learned some areas of the country—the planet—haven't witnessed a single drop of rain in months. The meteorologists would have us believe this is a problem, that whole populations of people cursed by constant sunshine are worthy of our lamentations. I have lamentations of my own and they have everything to do with the rain. Spencer tells me houses aren't built for such prolonged flooding, that the wood will rot even if the water fails in its quest to overtake us. He's busy building a boat in the second-floor, spare bedroom. “Just in case,” he tells me as he whittles away another rainy afternoon in what was once planned as a simple nursery. “Hedging your bets, Spence?” My unanswered question lingers a moment longer than I bear to watch. I've spent entire afternoons staring down from the bedroom window as the contractors, carpenters, and various other construction workers ferry back and forth in their giant trucks on the lighter days. They trade their services for the resources available, shopping sprees in the local stores, judging by the contents of their truck beds. As a child I would sit beside my mother on the hill behind our house and watch the clouds drift by the family farm. 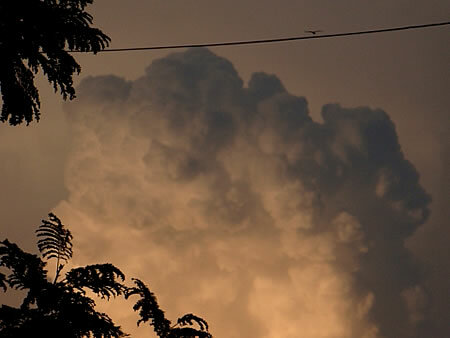 We'd imagine a host of unusual characters in those passing puffs of cumulous. Now, I sit in the upper-level window jamb, watching all sorts of loose material float across the water below. I keep my mind occupied imagining where the wood planks and uprooted fence posts are now lacking. Missing. I imagine what the chests and boxes might be filled with. Mostly it's garbage that I end up watching, and garbage cans and lids. Spencer is the quintessential jack-of-all-trades, but he's struggling to keep our small home illuminated. The water stains on the downstairs walls speak of a couple close calls, just a few more inches before the circuit box is submerged and we lose power for good. The phone still works on most days and my cell phone has been solid for nearly six months. Of course, bad news continues to flow from the satellite television: the local power grid has nearly succumbed to the flood; the national phone companies are drowning in repair costs, struggling to keep their networks lit; and there's little help in the coming forecast. Go away? Too late, now. Our sport utility vehicle, which ran us twenty-eight thousand clams just a year and a half ago, is parked beneath nearly five feet of water. I detect a small, but healthy current here in the valley. According to the news, in some areas the currents are more dangerous than the fear of electrocution. About the only thing we don't worry about is the damn house burning down. Spence calls it. The day it's over for the SUV. The rain refuses to let up all night. When morning arrives we find our first view of the truck where it lies beneath a foot of murky water. When the rain subsides and the water level finally falls to a manageable waist-high, Spence attempts to start the truck, but fails. He says, simply, “That's it, Jellybean. Put that one in your journal.” We lose the option of transportation. Calls to the local limo and taxi companies ring unanswered all afternoon. We haven't seen the roof of our truck in almost a month. Despair sneaks in between torrents of rain. Mom calls. Reception is scratchy, to say the least. In the city, things have gone from bad to worse. Her and dad—bad hip and all—are living on the next-to-top floor of their apartment building with a couple they managed to befriend at an HOA meeting. According to mom, rats have infested the building from the third floor up. The first two floors and the lobby are underwater. She describes a rat, small and mouse-like, pushing through a crack in the laundry chute. She's watching the rat as she speaks with me, her voice hinging on hysterical, her demeanor deceptively calm. The cell phone gives one last beep and finally dies, or so I think. Looking down on the screen, frustration mounting, I realize the batteries are just fine. The service itself finally quit. No signal found. Zero bars. The operators just gave up, their losses mounting exponentially while their profits suffered rain-induced shrinkage. It's a shrinkage that all the insurance in the world can never replace. With no one working, no payroll checks being cut, little money is finding its way to the creditors. The postal service—rain, sleet, snow and all that—hasn't functioned for months. We're down to two channels, two local networks caught by the dinosaur antenna Spencer never took down from the roof after we switched to satellite. The president pops in occasionally, savoring his chance to justify the government's latest reasons for inaction. “Federal funds will unravel themselves from the budget,” he promises. “Just hang in there a little longer,” he pleads. There will be no re-election. The writing on the wall is clear on that point. We'll be without power soon. Without order. Without recourse. Spence works hard on the boat, decimating our furniture, even pulling planks from the wall separating our bedroom from the spare. He's building his boat. I just don't know if I'll have the heart to help him sail. We finally lose power. It happens overnight. No warning. Not a sound. I remember waking, just for a moment, and squinting out into absolute darkness. No light from downstairs filtering up into the hallway. No light poking through the holes where Spencer tore planks from the wall to build his boat. I close my eyes and go back to sleep. I never even have to ask the obvious: What difference would it make? I wake sometime later and at first squint think it's still pitch black in the house, but upon further inspection I notice a softening of the edges, the tell-tale glow of light filtering through gray storm clouds. The rain is steady drizzle. Morning has arrived and struggles to illuminate more than the sky. It has the makings of a long struggle. Surprising myself, I actually sit up, cross the bedroom—careful not to wake Spencer—and approach the dresser where the last of our cigarettes live. On our final trip to the grocery store we managed to barter a year-old television set for six cartons of generic smokes. That was almost three months ago. We began to ration after consuming the first carton in five days. A pack per day, each. Rationing was Spence's idea and although I refused to face facts at the time, he was right. I fish the final pack from the dresser and shake one long cylinder loose. Cupping it in my hand with a broken pack of matches, I head for my perch. Squeezing out the bathroom window, I ease myself onto my haunches, sitting atop a ledge on the roof, feet hanging over the edge of the house. If I were to jump I'd hit water just below the first floor ceiling, maybe a little lower. I light the smoke and look out on the morning. The sky is a thick, impenetrable gray, hanging low and barely moving. The rain is swirling. Thin and misty. One of the better days. Small currents rifle through the water. I wager the neighborhood sits below seven feet of solid water, carrying driftwood, lawn furniture, clothing and building scraps about town in orchestrated paths having more to do with gravity than traffic lights. Everything seems to flow toward the center of town, the low spot, where the square was once filled with government employees on the weekdays and flea markets with arts and craft booths on the weekend. I can hear Spencer up and about, making noise, mumbling to himself and cursing the darkness surrounding him. He's less than pleased, heading for the circuit box. I can feel his anger and frustration reverberate through his bare feet as he stomps down the hallway, approaching the steps. “Means that's it, kiddo. Don't know what else to tell you. If it was the box, well, I could probably fix it, but there's nothing I can do about this.” There is nary a hint of despair in his voice. His inflection is cold. Dry. Disinfected. He stares at me for one long moment with a mixture of sadness, pity, even a touch of love. Then he looks away and follows his own eyes toward the spare bedroom. “What do we do now?” I ask the back of his head. “We go sailing.” This he calls out without looking in my direction. An hour later we have several bags packed with what food remains, smokes, towels, a tarp, and a half-gallon milk jug cut into a scoop for bailing water. We tie the perishables in garbage bags, along with the towels. There is no answer to the question—no question to the question—so I lift the stern of the boat—a canoe really—and we carry it toward the bedroom window. Spencer has already removed the screen and glass, so we fill the boat with our possessions and lower it to the water. He holds the boat tight with a rope and the current provides just enough pressure on the line, allowing me to climb down into our vessel. Spencer jumps, engulfed by the water in a splash, rocking the canoe with the ripples of aftershock. I panic, thinking for sure it will flip, until he resurfaces and steadies the ship. He climbs in and we're off, powered by a single paddle, which Spencer works diligently, guiding us toward the center of town, following the current. We slip between the tops of ranch houses in complete silence. We fail to witness one single example of power in our underwater neighborhood. Not for the first time, I realize, I haven't heard the chirp of a bird since just after the rain began. Where had they all gone? Why didn't someone suggest following them? I've learned complete silence is a frequently imagined, yet seldom attained, experience. I can hear the swish and ripple of the floodwaters easing around the canoe, the dripping of water from the rooftops and building outcroppings, the rushing of water—miniature rapids—where lower ground prevails and the current hurries to fill the gap. I hear heavy breathing from the seat behind me and turn to look at Spencer where he serves as guide and resident problem-solver. This particular problem will be too much for Spence to conquer, but I would never allude to a crack in my carefully-crafted confidence. There's a long pause, which we spend anticipating disaster more so than success. I fidget and yearn for another smoke, but we're rationed to two per day, combined, so I dare not waste one now. I sit, crouched and morose, insulated beneath my parka and an old tarp, staring straight ahead, squinting into the gray existence we discover and cannot escape. Several minutes pass before I recognize an odd shape in the fog. At first I think it imagined, but then I hear the hitch in Spence's breath and realize we have company. The bow of a similar homemade canoe finally splits through the mist and we immediately find ourselves waving toward the small boat. The boat turns toward ours, occupied by a man with kind eyes and his wife, maybe girlfriend. They wave in return. Equally grim expressions cast in our direction quickly turn to unspoken relief, which we share through knowing silence. Seconds before the tips of our boats connect, the splash of more neighbors rise from behind another house. A voice follows the splash. We wait to see who, or what, might appear. Ten minutes later we're three boats strong. We wait for more. Sure enough, after a few minutes, two more homemade vessels are visible moving down the flooded street toward our small group. One carries a mom and a dog, some sort of collie. The other is filled with the father and their two small children, a matching boy and girl. By the time my internal clock announces noon, I'm already busy foraging through our bags for food. We number roughly two dozen dinghies of various shapes and sizes, most homemade, with more on the way every few minutes. Not one word is spoken aside from the occasional grunts of labor and brief, terse instruction. Warm looks seem to outnumber the sad and the desperate, but not by much. Our overall countenance reflects a contrast of hopelessness and grim determination. The boats—a motley combination of barely water-tight vessels—are lashed together with rope, bungee, some even held to one another by bare hands until a more secure option presents itself. “So, now what do we do?” The question rises from the direction of the man with the kind eyes. “I guess we stick together.” Spencer answers casually, looking away from the man, unable to hold his gaze. Hours earlier we had electricity. We had homes. Hope. We thought of ourselves as isolated, but strong, even resourceful. We only thought of our neighbors in passing, good for the perfunctory morning wave or brief conversation. Now, we're all together. Homeless. A mishmash of rafts and dinghies bound to one another through a combination of nylon, elastic, desperation and human spirit. I think of the nursery—shredded to build our small boat. I think of what could have been, and find myself absently rubbing my belly where a small bulge should exist, but does not. I'm thankful, for that, at least. Another mouth to feed, another mouth brought into a world that has tilted off its axis does not seem fair. I look to Spence and he meets my forlorn expression with an attempt at a smile. He fails, but he draws me close, and I'm thankful for that, too. I'm thankful for what I don't have, and what I do.